Three imperiled bird species (the American oystercatcher [Haematopus palliates], Wilson’s plover [Charadrius wilsonia], and the least tern [Sterna antillarum]) that use beaches, dunes, backdunes, sand bars, shell mounds, and spoil islands for nesting on the Georgia coast. The least tern is listed as Federally Endangered¹. The U.S. Shorebird Conservation Plan lists the other two species as Species of High Concern. The nesting habitat for all three species has been greatly reduced; and the protection of the nesting habitat is a conservation priority. On St. Catherines Island, a marsh inlet—between Cracker Tom and South Beach Roads—is being managed for shorebirds and waterfowl. Overall, beach nesting birds are highly threatened globally. The major source of the threat concerns the degradation of beach nesting habitat from adjacent development and recreational use, nest predation, ocean overwash of nests, and loss of feeding areas. Shorebirds generally reproduce at low rates, so it proves difficult to reverse past declines and recover populations rapidly³. On St. Catherines Island, these species nest on beaches, bars, and shell rakes. St. Catherines and Little St. Simons Island produce the most successful fledglings for these species along the Georgia coast. 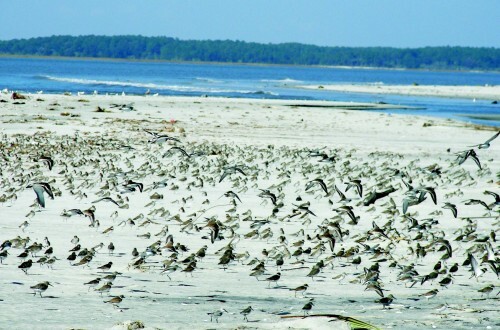 Natural tidal and storm surges overwash beaches, impacting nesting birds and vegetation, and reducing the spatial extent of appropriate beach habitat. Reduction in the regional sediment supply—from dams on rivers or harbors deepening, primarily from the Savannah River—also influences the spatial extent of beaches. Brown, S., C. Hickey, B. Harrington, and R. Gill, eds. 2001. The U.S. Shorebird Conservation Plan, 2nd ed. Manomet Center for Conservation Sciences, Manomet, MA.